Contemporary discussions about software development are rife with the mention of “cloud-native development,” even though the term rarely receives the elaboration and specification worthy of such a new concept. For example, cloud-native development is often confused with cloud-based development, which takes place by means of a browser or online interface. While cloud-based and cloud-native development share many characteristics, cloud-native development differs from browser-based development in important ways. For starters, cloud-native development refers to application development that is container-based, dynamically orchestrated, and leverages microservices architectures as per the CNCF’s definition of cloud-native development. Because cloud-native applications run in containers and are dynamically orchestrated, they exhibit many of the attributes of applications deployed in cloud-based infrastructures, such as elastic scalability and high availability. In the case of cloud-native applications, container orchestration frameworks take responsibility for attributes such as automated scalability and high availability that are typically associated with cloud computing. Moreover, the microservices-based quality of cloud-native applications translates into modular applications that accelerate application design, development, and lifecycle management. Cloud-native applications are fundamentally container-native applications and require developers to achieve familiarity with containers and associated orchestration frameworks such as Kubernetes. The need to demonstrate proficiency with Kubernetes requires developers to obtain expertise with developer tools that provide insight into relationships between discrete containers. Furthermore, developers need proficiency with the design of microservices-based application architectures that are executed in Kubernetes. What is most notable about cloud-native applications is the conjunction of a container-based deployment infrastructure, marked by the scalability and high-availability characteristic of the cloud, with microservices-based architectures that promote enhanced development agility and velocity. The microservices quality of cloud-native applications, for example, accelerates the delivery of application enhancements, updates, and debugging. This approach thereby creates a strong foundation for the implementation of continuous integration and delivery processes and the integration of DevOps into the development lifecycle. Examples of cloud-native applications include container-native, microservices-based applications and container-based, functions-as-a-service applications. The fact that container-native applications encompass both container-native and functions-as-a-service applications illustrates how the cloud-native development paradigm stands at the forefront of innovation related to the intersection of infrastructure and cloud-based development. By eschewing monolithic applications that are deployed on-premise, cloud-native development inaugurates a new modality of application development. This modality is marked by the automation of scaling and high availability at the level of containers, in conjunction with microservices architectures that facilitate expedient debugging and issue resolution. Challenges specific to cloud-native development involve application lifecycle management and, specifically, debugging multi-container applications to perform multifactor root cause analysis. 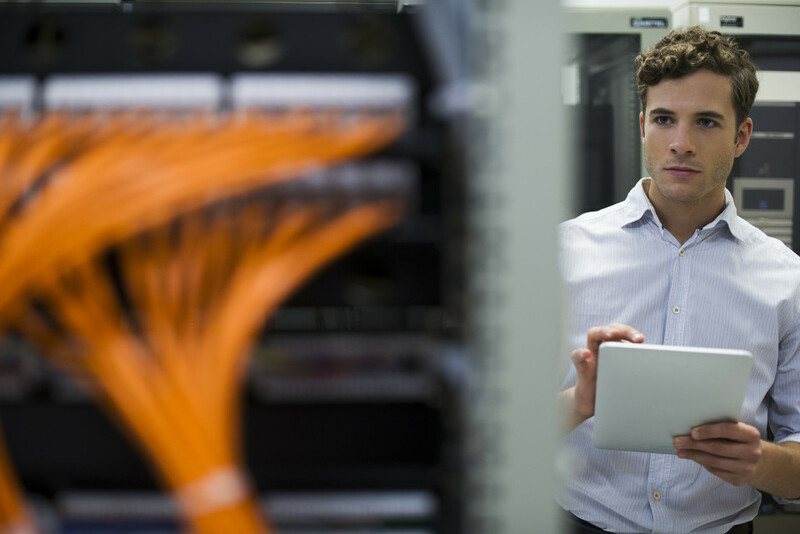 Other challenges include creating an infrastructure for alerting and monitoring for Kubernetes-based applications that deliver actionable business intelligence for application performance management purposes. In addition, cloud-native developers need to learn how to effectively leverage developer tools to design and develop container-native applications that are exemplary of loosely coupled, microservices-based architectures. Whereas cloud-based development refers to application development executed by means of a browser that points to a cloud-based infrastructure, cloud-native development refers more specifically to application development grounded in containers, microservices, and dynamic orchestration. Developers would do well to master the basics of container-native development that leverage cloud-based IDEs and development frameworks, since container-native development is likely to become increasingly important in the future. Because developer tools that specialize in container-native development are rapidly maturing, developers should pay close attention to how their IDEs and developer tools are adding features and functionality to facilitate the management of loosely coupled systems. Monolithic applications are rapidly transforming into relics consigned to legacy applications that render them challenging for developers to update or modernize for a variety of deployment infrastructures. Cloud-native development, however, embodies the future of application development. It undergirds the development of modern applications marked by enhanced application portability across a multitude of infrastructures because of their implementation in container-based infrastructures. Developers should expect rapid innovation in container-native developer tools and strive to update their skills accordingly by understanding the intersection of cloud-based and cloud-native development. Read more on how to evaluate and what to expect from DevTools in this IDC Vendor Spotlight paper sponsored by SAP, Addressing Digital Transformation Challenges with Application Development Tools, #EMEA44204018, August 2018. Authored by Arnal Dayaratna and Larry Carvalho. Stopping fraudsters at the front door is a priority, and layered controls are essential to stopping fraud attacks rapidly, agilely, and efficiently. Identifying fraud early requires enterprise-level vigilance and context around an individual’s behavior. Technology can facilitate bilateral sharing of intelligence, such that what you learn at point of application can inform your post-book control strategies as you manage your member base, detect transactional fraud, or prioritize collections on your bad debt book. Similarly, what is learned downstream, such as information about compromised identities and charge-off information, can be invaluable in upstream decisions such as application fraud via a feedback loop. However, where in your fraud controls should you be considering post-book controls? And where can you work better with your partners in risk to mitigate losses? In this clip, I share some insights into ongoing customer monitoring for identity-based fraud. Want to learn more? Check out the full webinar “Layered Defenses in the Fight Against Application Fraud”. 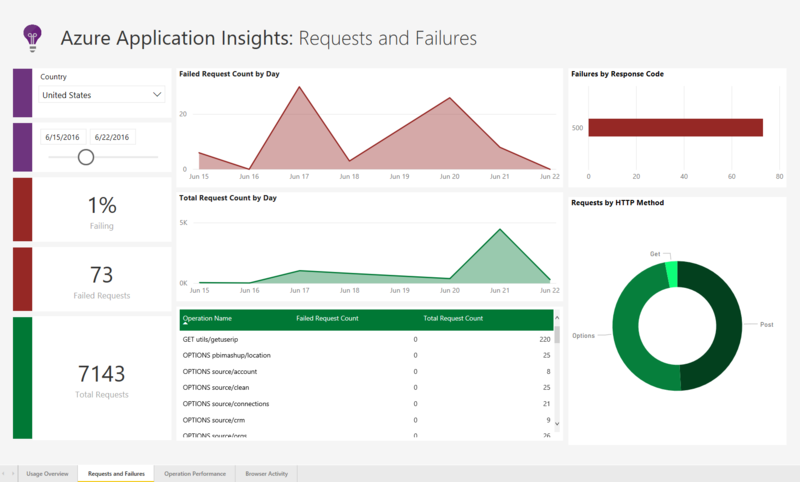 Today we are excited to announce the release of the Power BI Performance Management solution template for Azure Application Insights. This release brings comprehensive telemetry data into the growing suite of Power BI monitoring solutions including the Azure Activity Log Analytics template. All you need to get started is an Azure subscription with an existing Application Insights instance. 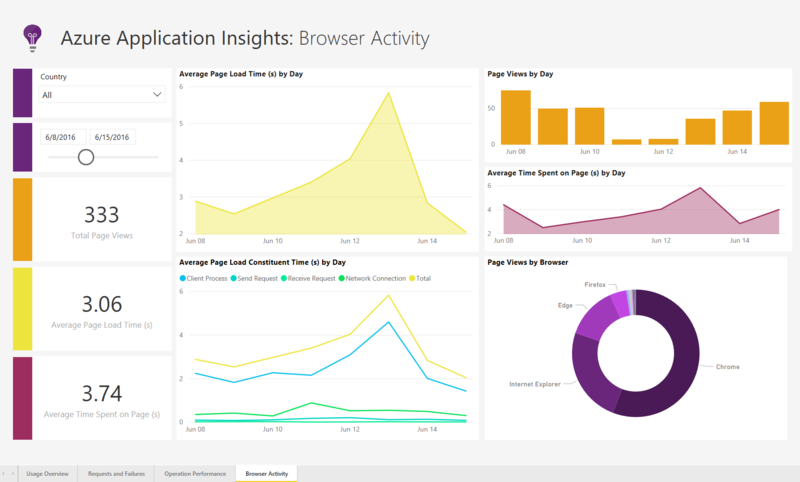 Behind the scenes, in a matter of minutes, our installer will configure and provision all the resources required to deliver your Application Insights monitoring analytics on top of Power BI’s visualization engine. The result is a business intelligence solution that leverages Azure Data Lake Analytics (orchestrated by Azure Data Factory) and Blob Storage to translate your telemetry metrics into dynamic, compelling, ready-to-share reports. 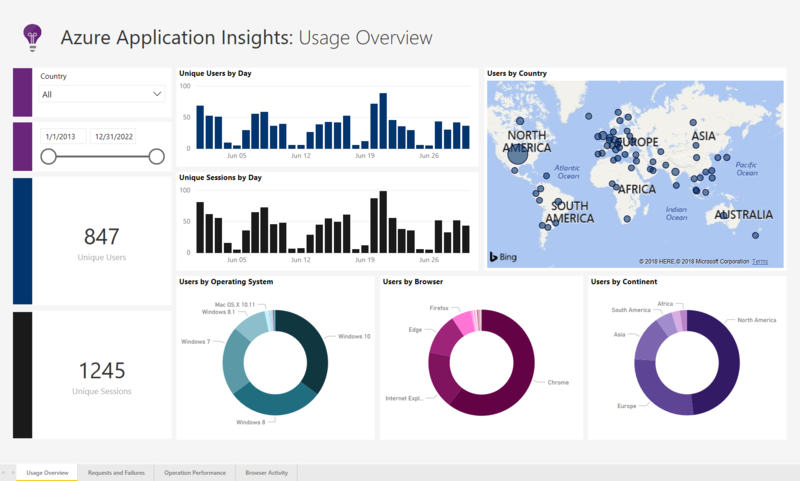 This solution offers out-of-the-box reports—on Application Usage, Operation Performance, Browser Activity, and Request Failures—that translate familiar Azure dashboards into dynamic, customizable Power BI visualizations. Integrate metrics from distinct telemetry sources to generate charts tailored to your team’s needs. Cross-filter data by universal dimensions such as date, location, and user ID for deeper monitoring insights. Detect and diagnose anomalies by leveraging drill-down capabilities to learn exactly what operations or dependencies failed. 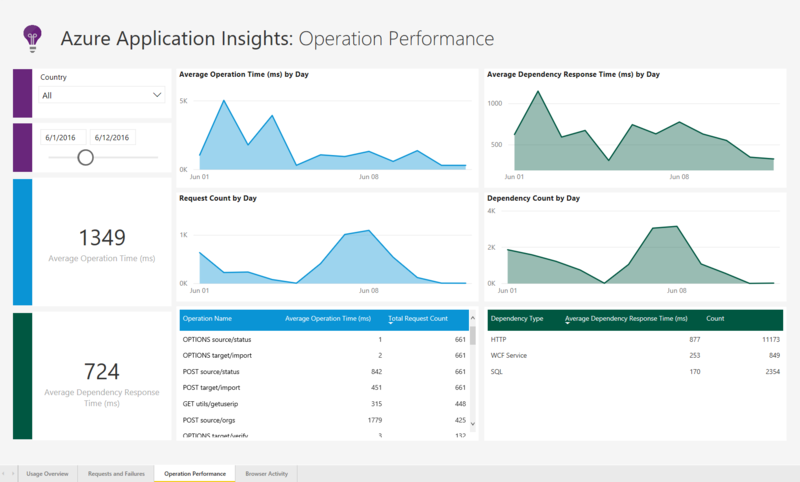 Like the Analytics workspace offered by Application Insights, Power BI allows you to query and visualize data from all your team’s telemetry tables. Our solution combines these sources into a single pane of glass on top of a predefined data model, generating powerful visuals that you can share in integrated reports—without ever needing to export individual Kusto queries. Deliver monitoring insights to users outside your Azure portal, which can be kept secure. Application Insights retains raw data points for up to only 90 days. Our solution leverages continuous export and cloud storage to extend this window of time, enabling longer-term trend tracking of up to years’ worth of data. Monitor both historical and incoming activity, drilling into days and eventually decades. You can explore an interactive sample report, watch a demo video, or get started with the installer here. Give it a try and please let us know what you think—the team is always interested in feedback. You can reach us by emailing PBISolnTemplates@microsoft.com or by leaving a comment on the Power BI Solution Template Community page. One of the most powerful features (and there are lots) that I’ve found about Power Query is the ability to hold an entire table in a single cell. Once I’ve got a table in a cell, then I can start performing some magic otherwise impossible in the pre-Modern Excel universe. You can download the .pbix and .xlsx formats to follow along here. Some of that magic is nested calculations using those cellular tables. Before I get to a specific application, let me give some finance background. A central problem in finance is answering the simple question: How much is this contract worth? For example, Bob might say he’ll give me $ 102 in a year, and I want to know how much I should pay him for that guaranteed money. If I figure out that the value of the contract is a $ 100, then I’m saying that the guaranteed $ 102 in a year is worth $ 100 today. This means I get a 2% interest on my $ 100 investment. This is called the one-year spot rate, and there are similar rates for all sort of different time frames. Taking 1/ (1+.02) gives me the discount rate and multiplying this by the $ 102 payment gets me to the $ 100 value of the contract. The next step is that I may want to know how much $ 102 two years from now is worth next year. So instead of figuring out what it is worth today, I want to know what it will be worth in a year. To figure this out, I need something called the forward rate, which tells me the annual interest rate one year in the future, in this example. With the forward rates, I can take a complex series of future payments and find the value of all of those payments today, but also the value at different points in the future. The complexity is that depending on when I want to value them to and the timing of the payment I need to use different sets of forward rates and that’s the application I’ll walk through below. I have a model that produces some monthly cash flows from a contract going out ten years. These cash flows are variable depending on different economic scenarios. To determine the value of the contract under each scenario, I need to use the forward rates to “discount” these cash flow back to the valuation date. So I start with some monthly forward rates for each of the economic scenarios and load them into Power Query. Next, I need to calculate the discount rate that I can multiply by the cashflow. This lets me discount a cashflow at that time back one month, but I want to be able to discount all the way back to the beginning. To do this, I need the product of all of the discount factors from the cashflow date to the valuation date. To get this, I group all of the forward rates for each scenario. For each of these scenarios, I need to replicate these tables and filter them down the discount factors I need for the different dates. To set the dates that I want to value the contracts, I create a new column with a list of the dates I want (the next 12 months) and expand that out. I do the same thing to add the cashflow dates that I’ll be discount from back to the valuation date. So, I’ll only want to pick up the discount factors starting from the valuation date. With all of this setup, I’ve set up the boundaries of the discount factors that I need, so all I need to do now is filter down the table data to the discount factors that I need. To do that I add a new column using a custom function to filter the data. Since we’ve grouped the table into cells, we can pass the column [Table Data] into the SelectRows function. The real magic comes in the function. The r variable represents each record in the [Table Data] table. This allows us to perform conditional (or other) logic by comparing the rows within the [Table Data] cell and the related fields in the parent table. So, we are filtering [time] within the grouped table by comparing it to the [valuation date] and [cashflow date] in our parent table. Where before we had a full table in each cell, now we have a grouped tables filtered down to the relevant time points. The final step is to calculate the cumulative discount factor, for example going from time 4 back to time 2. This is easy to do with a List.Product on the filtered table’s discount rates. Cleaning up a bit I have a nice table with all of the discount factors that I need to get the value of a complex contract cashflow under different scenarios at different points in time. Now I can link up my discount rate table with my cashflow table to calculate the value of the contract and explode it out to 1000 different scenarios and 100s of different contracts. As with all things Modern Excel, I can update my inputs, click a button and I’ve got all updated results! Once finished I can load into Power BI Desktop to show the maturity date of the forward rate curve or the cashflow dates of multiple discount curves with ease! In a recent blog post we explored the underlying concepts behind machine learning and its tremendous benefits in fighting application fraud. 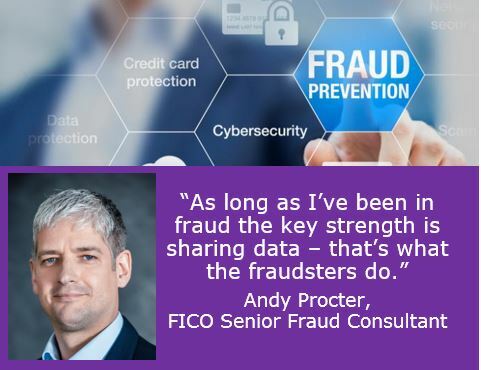 Since then, I had the opportunity to speak with one of FICO’s principal scientists, Derek Dempsey, who shared how AI and machine learning are solving problems in application fraud. 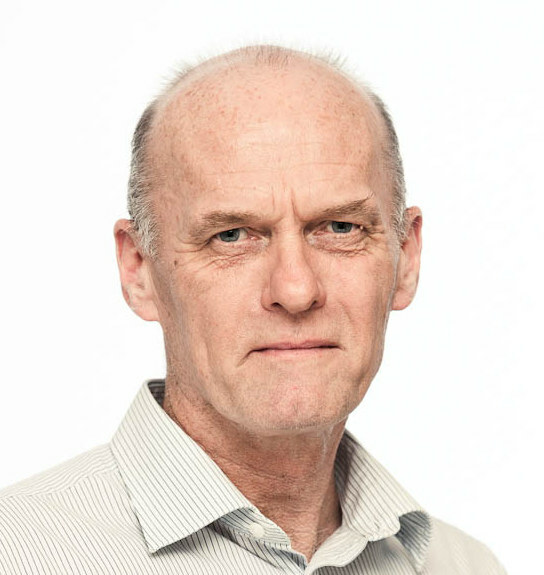 Derek has worked in machine learning and advanced analytics for 20+ years, and he is a specialist in the development and application of predictive analytics for application fraud detection. As a man of many talents, when he is not busy fighting crime through intelligent computing, Derek dazzles the London stage as an actor. I think the biggest challenge will be governance and regulation rather than analytical challenges. Building machine learning models will require a deep understanding of how financial institutions work, how fraud is detected, and how fraud is controlled and managed — it’s not just about pointing algorithms at the data. Can you explain what adaptive analytics are, and do you think self-learning models have a place in application fraud? There are several flavors of adaptive analytics. For example, there are adaptive elements such as real-time adaptive profiles that maintain recursively updated feature detectors applied to individuals or to groups of entities. We also use self-calibrating analytics where the models derive data-driven groupings and distributions that are constantly updated and re-calculated. Another type of adaptive analytics uses confirmed fraud and non-fraud dispositions from the analysts working cases to adapt model weights so that when new fraud and non-fraud patterns are discovered this information is fed back to improve the model performance. This methodology is very successfully leveraged today in FICO’s Falcon Fraud Manager Platform to detect enterprise payments fraud, and is currently under development for application fraud within FICO Application Fraud Manager. We expect this to have a major impact on improving application fraud detection. Feature generation is something we discussed in our most recent blog as an important part of generating a predictive model. Can you tell us more about the feature generation techniques that provide the most uplift for predictability? Feature generation is the key to unlocking the value in data. In time series data, we want to look at velocities of activity, for example, time-clustered transactions that are indicative of fraud. In application fraud, two main areas of focus are the generation of features that highlight the risk associated with the applicant and application and network analytics that identifies relationships between applications. Much of the data available at application is categorical, such as employment status, occupation, and residential status. Handling these categorical risk variables through risk tables and generation of indicators is critical for effective analytics. However, we need to enhance these features through the development of velocity variables and network variables to extract maximum information from the data and detect different types of fraud attack. In application fraud, another area where we see significant uplift is through fuzzy matching, for example, against previous applications. We see that fraudsters often make several attempts to commit application fraud using slightly varying details to gain access to credit products, e.g. changing address, name, occupation or salary details, etc. The ability to fuzzy match against previous applications – and other data sources – and identify possible matches is important. This information can also be included within the models as additional features. Brute force and botnet attacks can also be quickly identified using this method. When operationalizing machine learning models for application fraud in an originations environment, what considerations should be undertaken? One critical factor is to ensure that the operational data environment is aligned to the model data specification. Another key factor is to ensure that the end-users, the business team, understand the detection rates and false positive rates associated with the model. This must be explicit in the model report so that the operational teams can define appropriate thresholds to manage the fraud cases and prioritize queues. The ‘interpretability’ of the model is also of critical importance, as results must be explainable not only to the fraud analyst but also as part of the broader regulatory regime. The fraud analyst needs to understand why the model has scored this application high to understand quickly the possible fraud type and the additional checks required. FICO provides model reason codes that indicate the main features contributing to the model score. More broadly, while fraud checks are excluded from much regulation, the model governance teams need to be able to confirm that bias is not being introduced into the originations process. See Scott Zoldi’s post on explainable AI. Lastly, the production environment and business requirements around score generation need to be accounted for in the model design. All environments are dynamic: OS upgrades happen, system upgrades, security patches and so on. Models become part of this ecosystem and, as such, need to be robust and maintainable. 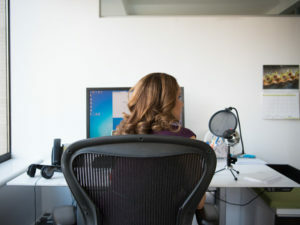 The recent move to cloud-based solutions removes most of these dependencies, however, and this move to cloud has been a core element of FICO strategy in recent years. What kind of uplift can a financial institution anticipate from using an analytic approach for application fraud, over and above a rules-based approach? We typically estimate uplift in the order of 30% – 40% in terms of fraud detection but this is dependent on many factors and can be much higher. As with all types of fraud detection, layered controls are critical. A rule makes sense when you have a well-defined knock-out (KO) criterion — for example, this ID is on our negative list as a fraudster so exclude them. This doesn’t need a sophisticated model – it’s a simple KO rule. Where analytic gains are most significant is by combining “soft” rules and indicators into a sophisticated algorithmic calculation that will utilize multiple features and result in much greater accuracy. As I mentioned earlier, feature generation creates a much richer data representation that allows the algorithms to outperform rules significantly. 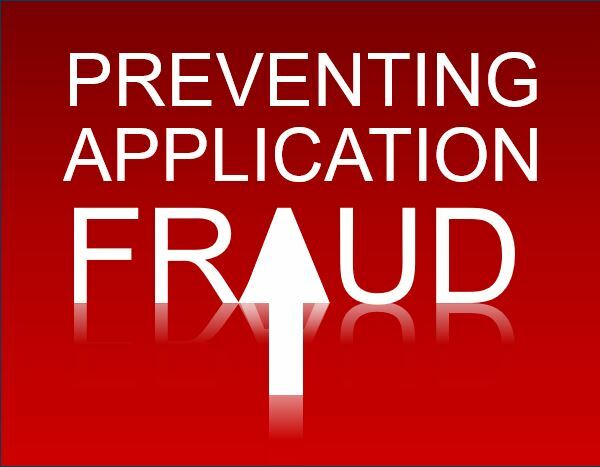 I know FICO scientists are working currently on a consortium model for application fraud — why should clients be excited? A consortium model uses data from multiple organizations, and this rich data set can provide a huge gain in power. We build consortium models for payments fraud using the Falcon Intelligence Network, and you can read more about this approach in this post from FICO’s TJ Horan. . Using this kind of consortium allows a standardization of data requirements, tools and techniques and this in turn facilitates research into new machine learning techniques applied to produce increasingly powerful models. The consortium data is used for model development and innovation, but is not shared between contributors — for example, negative file lists are not shared as part of this approach. We expect to see big benefits from a consortium solution in application fraud by utilizing the feature generation methods and advanced machine learning techniques such as multi-layer self-calibrating models, collaborative profiles and Adaptive Analytics. Adaptive Analytics utilizes both the fraud and non-fraud dispositions from the fraud analysts to re-optimize model weights and enable a rapid response to new fraud trends as well as reducing false positives. A fraud consortium like the one we’re building is much more than just sharing data. It is about transforming fraud prevention with data-driven methodologies and continuous model improvement to find fraud an individual lender has not seen before. Thanks, Derek, for your time, it was a pleasure meeting and learning from you! Today’s briefing looks at how businesses have pondered what an intelligent workplace powered by artificial intelligence (AI) might look like. The day is finally here, and it’s not as daunting or as intimidating as many might have anticipated.